Each MSA20 enclosure comes with dual power supplies that are sufficient to provide power to the enclosure and maintain normal operating levels. Easy removal of parts provides better serviceability. No tools are required! 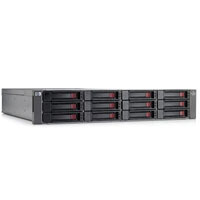 Provides storage capacity of up to 12TB per enclosure (using 1TB SATA disk drives). Modular design allows up to 21 enclosures to be mounted in one 42U rack for a single rack storage capacity of up to 189TB of disk storage or up to 8 enclosures in an MSA1500 or a MSA1510i configuration for storage capacity of 64-TB in an entry-level SAN.